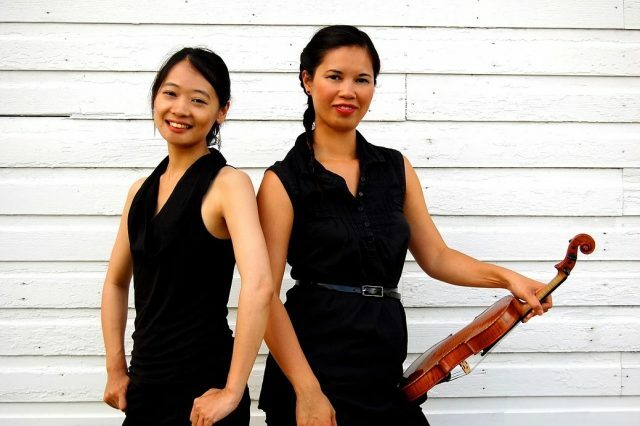 Futaba Niekawa, left, and Kerry DuWors will perform as duo526 at the Lorne Watson Recital Hall on Tuesday, Nov. 14. BRANDON – A visit to an idyllic New England setting provided the inspiration for an upcoming Pro Series recital by duo526. Brandon University (BU) School of Music faculty member Kerry DuWors and collaborative artist Futaba Niekawa will make their third appearance in Brandon as duo526 on Tuesday, Nov. 14 at 7:30 p.m., at the Lorne Watson Recital Hall in the Queen Elizabeth II Music Building. The duo will present a programme with the theme of fantasy pieces. These include Bolcom’s Duo Fantasy, Mackey’s Elegie and Fantasy, Villa-Lobos’ Sonata Fantasia No. 2, and Bax’s Violin Sonata No. 2. DuWors and Niekawa met at the Eastman School of Music in 2010, while studying with lauded professors Jean Barr and Charles Castleman. Together, duo526 – named after the first piece the musicians honed together, Mozart’s Sonata No. 35 in A Major, K. 526 – have been artists-in-residence at the Banff Centre for the Arts as well as at Brandon University and Indiana University. They have performed recitals in Canada, the United States and in Europe, and have a recording entitled Ballade to their credit. DuWors has been a faculty member at BU since winning the Eckhardt-Gramatté National Music Competition in 2003. As well, she has won the Felix Galimir Award for Chamber Music Excellence, two Canada Council Career Development Grants, and she is a four-time laureate of the Canada Council for the Arts’ Musical Instrument Bank. A busy performer as well as educator, DuWors was the soloist in Beethoven’s Violin Concerto in D Major with the Winnipeg Symphony Orchestra in September. She has also appeared as a soloist with the National Arts Centre Orchestra, the Manitoba Chamber Orchestra and the Saskatoon Symphony Orchestra. “There’s a special atmosphere and energy about performing on ‘home turf’ that comes when you know practically everyone in the audience,” says DuWors. “The chemistry between audience and performer is electric. Tickets for the performance are $15 for adults and $10 for students, seniors and alumni, and are available at the door or in advance in the Main Office in the School of Music. The next Pro Series concert is slated for January 9, 2018, at 7:30 p.m., and it will showcase several of the School of Music’s talented faculty members.